Hooray, it's Spyro! But wow, I didn't know he could look this menacing! Such an intense expression. Hi RubbberRabbbit2. 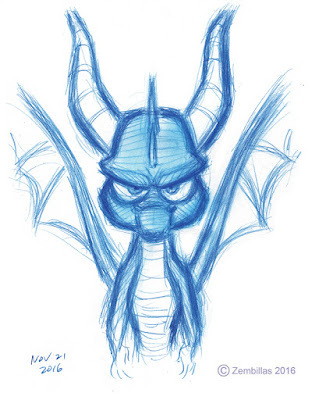 Spyro was originally intended to be an intense character. That's how I approached him when he was initially created. He's been modified since then. When I draw Spyro I go back to what I was doing at the beginning so that's what you see. Ahh Spyro! Believe it or not, but I went to own of the book stores nearby my place and guess what they had in the gaming section? That's right! Spyro the dragon! The first and second one! What made it cooler was that it was the Collector's edition, if I'm correct. Sadly, I couldn't get it because I (firstly) didn't have 60 dollars and (secondly) I didn't have a PlayStation. I'm really into the old games that people played long ago and Crash Bandicoot and Spyro is on my list to play. I still have the picture of it on my phone, haha. Anyway! This is really good! I'm actually teaching myself how to draw Spyro but I can't do dragon anatomy so I wanted to ask you if you could possibly do a step by step tutorial on how to do it. I could imagine Spyro having this face if he was serious or something, but he's more of the cocky type, so seeing this face on him is quite interesting! Hi Vanila Latte and Happy Thanksgiving to you! I try to include some sort of element of intensity to the characters I draw. Either intense cuteness or rage or fear or whatever I'm looking for. Sometimes I opt for going with an understated or subtle expression but I'm always looking to connect the character emotionally with the viewer. What the character is feeling is in many ways just as important as how the character looks. As far as drawing dragon bodies, look to research animal anatomy in general and it'll help you. I'll keep in mind what you suggested and see about creating a tutorial on how I approach drawing Spyro.